3Dp (three dimensional print) technology first encroached the manufacturing arena in the late 1980’s as a means to create prototypes for product development. Though back then the process of 3Dp was widely known as RP; Rapid Prototyping Technology. Whilst the terminology has changed as the technology has evolved the primary purpose of 3Dp, or additive manufacturing, has remained the same; the rapid and flexible production of end-use parts. 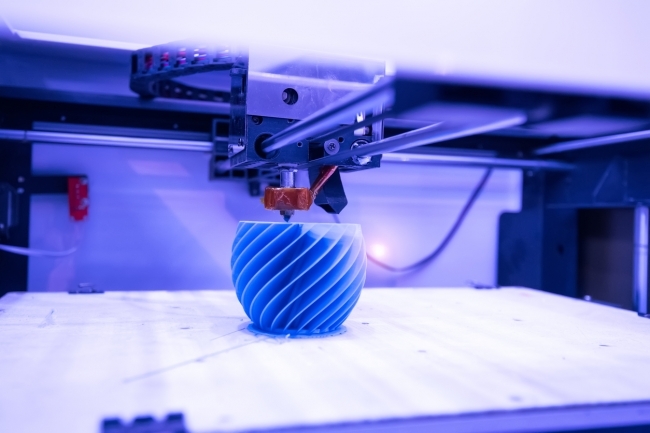 Three dimensional printing has unparalleled flexibility within the manufacturing market. It presents the ability to create objects out of (almost) any material to include polymers and composites, metals and ceramics. Though this portfolio is also evolving as 3Dp is being applied to a wider spectrum of manufacturing and even construction processes. As business owners look to bench mark themselves and remain competitive within what is at present an ever evolving market, they are embracing new methods by which they are able to deliver increasingly ambitious projects. One such method is the adoption of automated robotics; using industrial robots as a means to push the boundaries of 3Dp technology. The process of 3Dp is a means of building objects in layers, all from a computer model, or CAD. Algorithms then plot the application of the material being used layer by layer until the object is complete. Though in order for the process to succeed, absolute accuracy is required and the tools that are utilised with the construction process should offer a level of flexibility, speed, accuracy and reliability consummate with the task at hand; consider the KR6-R900-sixx and the KR30-L16-2 industrial robots from KUKA. The six axis industrial robots are currently in situ within a 3Dp application at Ai Build, providing a means to deliver large scale three dimensional structures. The London based 3Dp consultancy have embraced automated robotics as a mean to satisfy the most ambitious of project briefs, producing some of the most advanced three dimensional structures in today’s additive manufacturing market. Repeatability and accuracy, along a predefined trajectory, are key to the success of any three dimensional printed project that incorporates industrial robotics, as are reach and payload. Payload certainly when we consider the tools that might be introduced within a 3Dp application, incorporating an industrial robot; consider print heads used within additive manufacturing processes. Reach also plays a critical role in the production of complex 3D printed objects. Some of the structures that Ai Build are able to produce, using automated robotics, can reach dimensions of up to 3.2m x 2.4m x 2.8m, a far cry from many of the smaller products that we associate with being produced using 3Dp technology. The six axis robots from KUKA provide Ai Build with a greater flexibility in extrusion path and direction. 3D printers or three axis machines available on the market don’t provide the diversity of movement required for 3D printing complex structures with a freeform toolpath. KUKA robots also operate to a position repeatability of 0.03mm which enables those used by Ai Build to produce consistent output, time after time. The use of the industrial robots as a complimentary element within their 3Dp applications has seen Ai Build develop an established portfolio of clients, to whom a wide variety of design concepts are available. From multi material printing; large variety of PLA and ABS based materials can be used and mixed within one object, to adaptive resolution; different layer height and extrusion thickness options are available with their custom built extruders. By embracing automated robotics into their operations, utilising the precision of the KUKA industrial robot, Ai Build achieve dimensional accuracy, regardless of the size of the object that is to be produced, ensuring that each structure is constructionally sound in its composition. A critical feature when we consider the public environments into which the structures are placed; art galleries, universities and at trade fairs. Historically the distinction between accuracy and resolution didn’t matter as much as in today’s additive manufacturing market. It was sufficient for RP. Though when we consider in which areas 3Dp technology is being applied today, we can see how the relationship between accuracy and resolution are critical; consider how customised 3D printing is transforming healthcare as we know it. The manufacturing industry is evolving and the advancement of 3Dp technology is just one element that supports the transition into digital manufacturing and industry 4.0. 3D printing is a fascinating technology that makes it possible to manufacture incredibly complex forms which would not have been possible using traditional methods such as moulding or milling. Ai Build is developing 3Dp technology for 3D printing large scale objects cost efficiently at a very high speed, in partnership with KUKA robotics. Pushing boundaries and challenging the status quo. Who knows what the future holds? Additive manufacturing certainly has a place there.